Here are some photos from the shoot. I had 400-speed film in the camera so the posse photos aren't as sharp as I'd like, but certainly better than nothing! I only had one roll of film so unfortunately missed shots of a lot of interesting looking outfits. 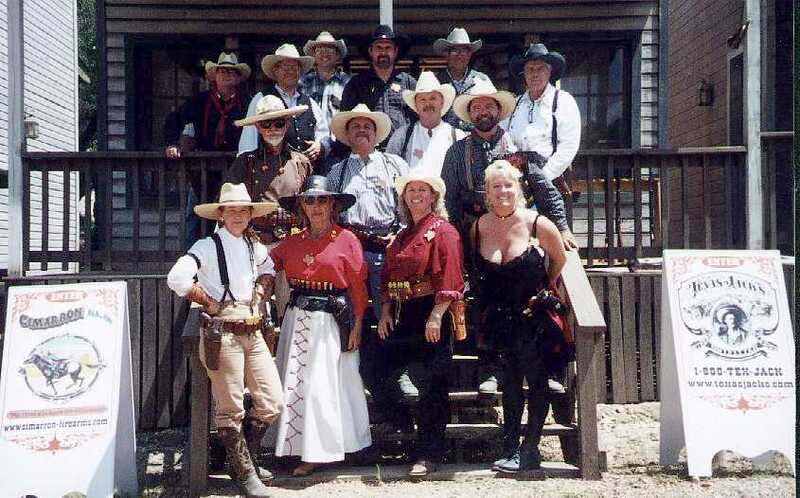 And I regret not getting a shot of A.D. Texaz (match director) or Tombstone Mary (everything else) in their banquet finery, but they can be seen in the worker's posse photo. They are great folks who did a wonderful job and they are hilarious to be around! There were shooters from 6 states present, including a contingent of about 20 from Arizona! Congratulations to Lead Dobber, overall match winner, and to Pea Patch and Texas Jack Daniels, the Sunday Top Gun Shoot-off winners. Also to Griz, who received the "Spirit of the Game" award for having WAY too much fun! Of course, we are ALL winners! A great big thanks to Mike Harvey (of Texas Jack's and Cimarron Firearms), for sponsoring the shoot and for providing the sport of CAS with such a wonderful place to shoot. See Tin Star Ranch. CORRECTION: I have been informed that I have numbered the posses incorrectly below. Dang, I was afraid I'd get them mixed up. I think I have them numbered correctly now, although the names of the files are still wrong. - Posse 5 - click picture to enlarge, or click here to "supersize"
- Posse 4 - click picture to enlarge, or click here to "supersize"
- Posse 3 - click picture to enlarge, or click here to "supersize"
- Posse 2 - click picture to enlarge, or click here to "supersize"
- Posse 1 - click picture to enlarge, or click here to "supersize"